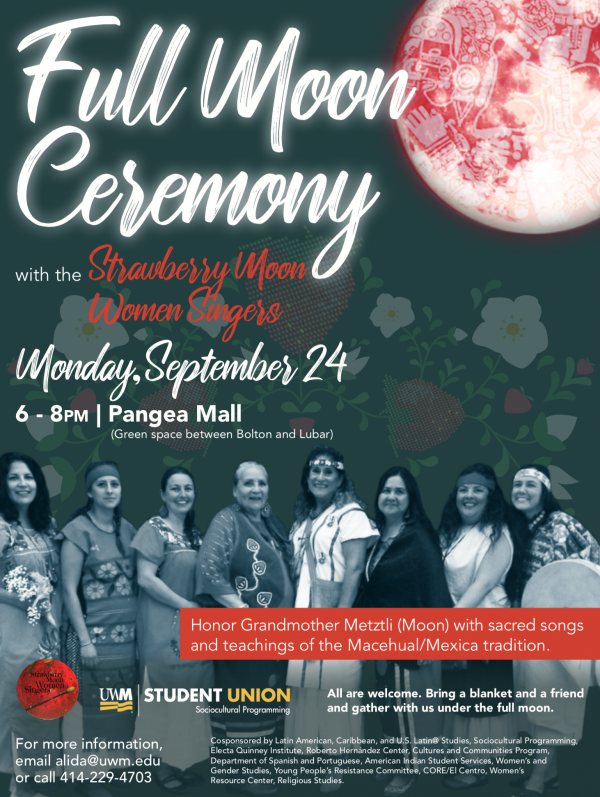 Join Wisconsin-based Indigenous women’s hand drum group, Strawberry Moon Women Singers (SMWS), for a Full Moon Ceremony honoring Grandmother Metztli (Moon). Sacred songs and teachings of the Mexica or Macehual tradition will be shared. SMWS sing songs in Spanish, Nahuatl, English, and Anishinaabemowin. The Strawberry Moon Women Singers is a Wisconsin-Based Indigenous Women’s Hand Drum Group. They are Indigenous women of the world uniting to heal through music. Founded in December 2012, Dona Yahola had the dream of starting a healing drum group with women coming together, singing, healing and praying together. There are 9 members ranging in ages and generations coming together of Ojibwe, Oneida, Mexica, Apache, and Maaya descent, of Brasil, Texas, México, and Wisconsin. Empowered by their ancestors, elders and decolonizing their roots, the group sings together, prays together, and holds ceremony together for their communities. They share stories and prayers with the guidance and permission of their elders.